Isabel Garvey is Managing Director of Abbey Road Studios. The disruptive technology in question here is automated mastering. Online, cloud-based services are springing up which purport to take raw mixes and deliver polished masters without any direct human involvement. Perhaps the best-known of these is LANDR, which has been making waves for a year or two now, while Abbey Road have gone into partnership with rival service CloudBounce. 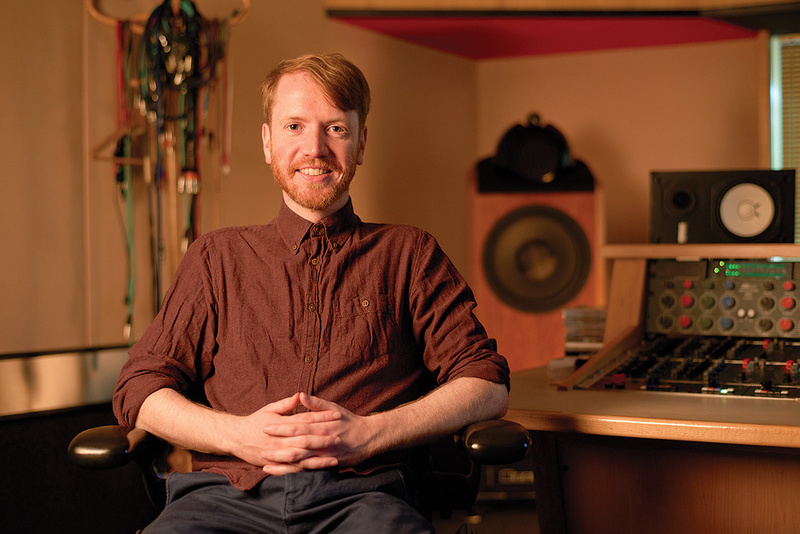 Does the rise of automated mastering threaten the jobs of established mastering engineers, including the distinguished team at Abbey Road itself? Which aspects of the mastering process, if any, can successfully be handed over to automated processors? 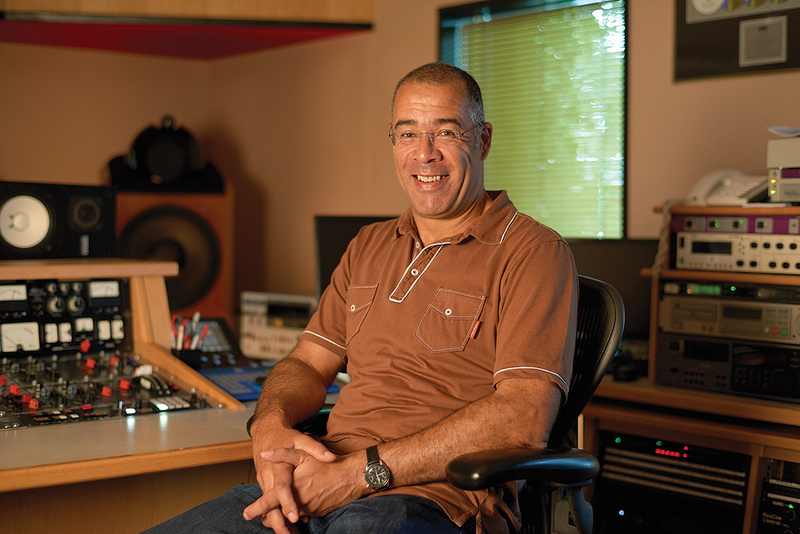 Sean Magee has been an Abbey Road mastering engineer for almost 20 years, and won a Grammy for his work on the Beatles remasters in 2009. 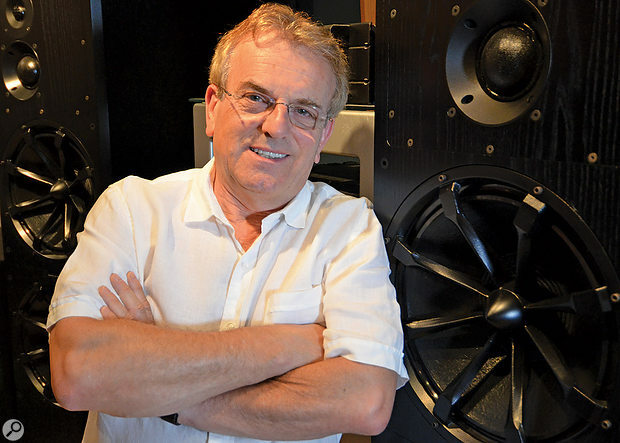 Vlado Meller is one of the world’s most in-demand mastering engineers, with a credit list that runs from Celine Dion to Metallica. Over the course of a long career, Geoff Pesche has worked at many of London’s biggest mastering studios. He joined Abbey Road in 2006. He goes on to offer a warning to any human mastering engineer who believes that algorithms will never meet the challenge of assembling satisfying albums: “With that said, we still are super-interested in albums. I’m in my ’40s. I’m a ‘lean-in’ listener that still listen to records. Using algorithms to make a coherent album is also a really fun problem to solve. We do have an album mastering prototype that we use in our professional services division, where we do albums for major labels. We run them through this prototype, and then our human engineers tweak the results. The algorithm learns from what they are doing and gets better. After a year of doing this, the results are starting to get quite interesting. 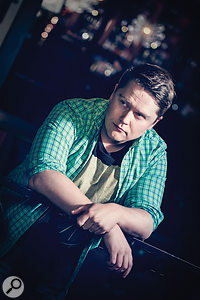 We’re excited to release it when it’s ready, but it’s going to take a lot of data to get it right!” Anssi Uimonen is co-founder and CEO of CloudBounce. The human mastering engineers I talked to were also sceptical about the ability of automated services to ‘understand’ genre-specific trends, and to respond to unconventional artistic visions. Abbey Road’s Christian Wright gives an interesting real-world example. 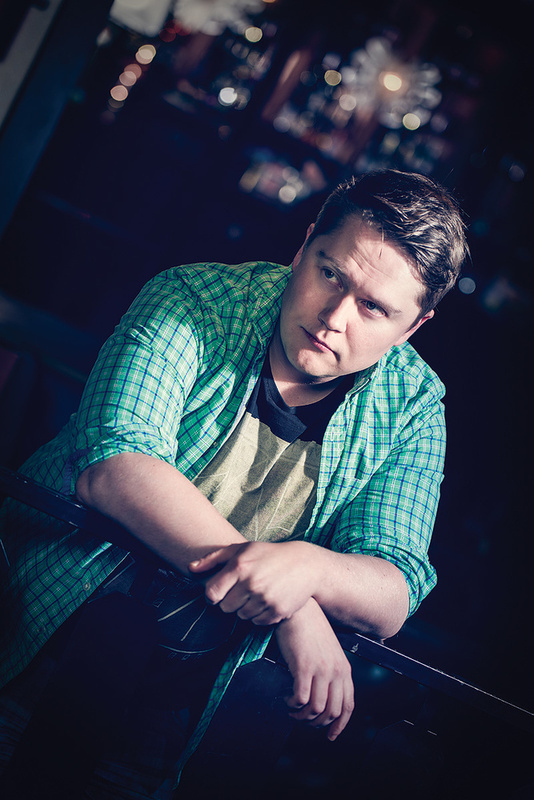 “I uploaded a deliberately bass-heavy track to some of these automatic services to see what came out. It came back with all the bass nicely tamed and reined right back, but it didn’t fit the intentions of the original artist. You need to know what’s musically right for the genre you’re working in, and for mastering machines that are supposed to be able to cope with any music you can throw at them, that means they’ve got to be able to reliably recognise styles of music, just from a sound file. That’s much, much harder than it might sound, and I don’t think any of these services are really there yet. Christian Wright joined the Abbey Road staff at the age of 19 and has worked his way up to his current position as one of their most sought-after mastering engineers. “A machine, or a piece of software, is always going to be behind the curve. An algorithm is just a set of rules for how to do something. But the ‘rules’ in music are always changing: as fashion changes, as new scenes spring up, new kinds of music are created, with new production techniques and popular sounds — and that’s always been particularly true here in the UK, where there’s a really fast turnover of styles and fashions at any one time — almost too fast, you might say. You can only react to those developments with an algorithm in retrospect, and program your software to do something because it sounds like something that’s already gone before. But the best new music will often break the rules set up by what’s come before. So what’s an algorithm going to do to really groundbreaking new music? It can’t help but treat it like something that’s gone before, because that’s all it will ever be programmed to do. A couple of months later, the programmers might come up with an algorithm that can master that style of music the way the original artist envisaged it should sound. But by then, there’ll probably be a new scene, and a new sound. There’s always going to be a lag. Sean Magee agrees. “You wouldn’t apply the same kind of mastering to Iron Maiden as you would to Sepulchre, but many people would consider them both ‘rock’. For some people, ‘rock’ might encapsulate any guitar-based band music from 1955 to the present, but it’s a fairly obvious point that there’s not one sound that works for any music recorded in that genre between now and then. There are so many genre-based mistakes that could be made by a machine. If you throw some drum & bass or dub reggae at a mastering algorithm, the chances are it will consider the bass frequencies to be far too high and tone them down, or even take them out. But that would be a massive creative error in those genres.” LANDR co-founder Justin Evans. In conclusion, it’s fair to say that although automated services are improving all the time, they are still some way away from fulfilling all the roles that a human mastering engineer can. But it would be a mistake to write them off as merely second-rate, cut-price alternatives to the real thing. As things stand, LANDR and CloudBounce are not competing with human mastering engineers but operating in an entirely new market, opened up by wider changes in the way music is created. And if Isabel Garvey and her team seem relaxed about the impact on their business, it’s because these services mainly target producers who aren’t otherwise using professional mastering engineers at all. “The technology available to the music-maker today is continuing to change and enhance the creative process,” she says. “There is more opportunity to tweak as you go along; to add to your work continually and collaborate rather than just follow the old ‘record, mix, master, finish’ processes. These shifts are affecting mastering in a number of ways, and are creating opportunities for both automated and human-controlled solutions. 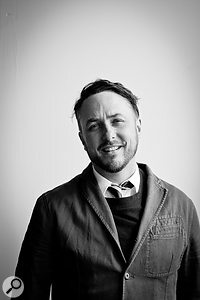 So, are these newfangled cloud-based mastering services any good? And what are they like to use? To answer these questions, I obtained some credits from both services and ran some tracks of my own through them. Out of curiousity, I also invited the Abbey Road mastering engineers who took part in this article to tackle one of the tracks, in an informal man-versus-machine master-off. LANDR and CloudBounce both reflect achingly contemporary trends in web design. From the user-experience point of view, both LANDR and CloudBounce are utterly of the moment, with much thought given to simplicity and streamlining, and endless pop-up opportunities to chat with team members. 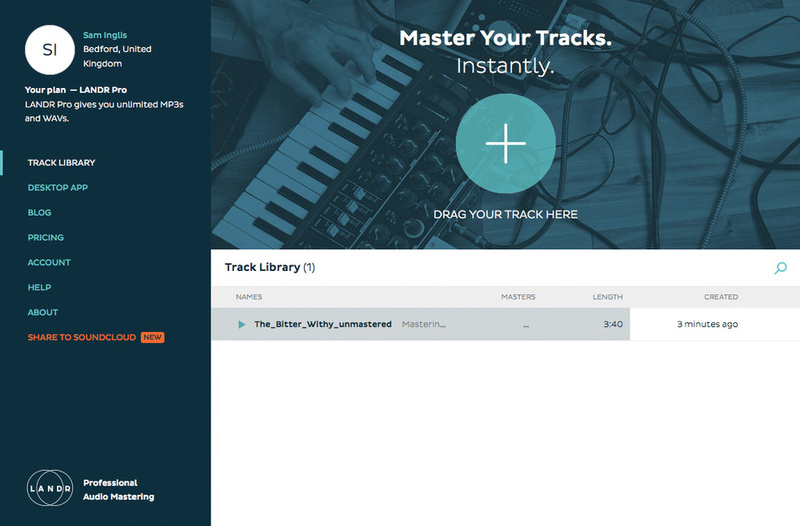 Both can be used as stand-alone Web-based services, but a level of DAW integration is also available, as is a desktop app in the case of LANDR. In all cases, there’s no denying the utter immediacy of the process. Assuming you’re using the Web-based version, you simply drag and drop your unmastered audio file from the Mac OS Finder or Windows Explorer onto a big circular target. 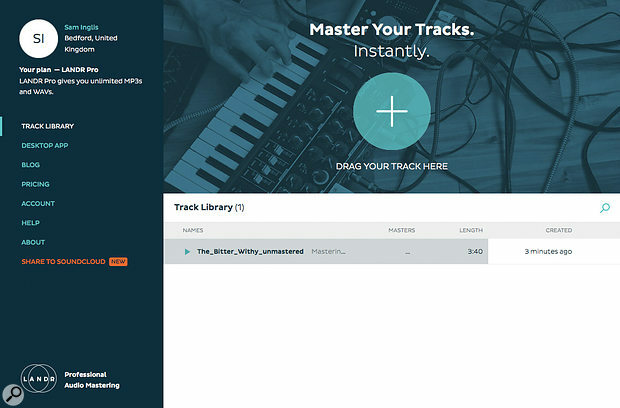 Once it’s uploaded, there’s a brief analysis process, whereupon your newly mastered track is streamed back at you, with a button that lets you A/B it against the unmastered original (without any form of gain matching, natch). 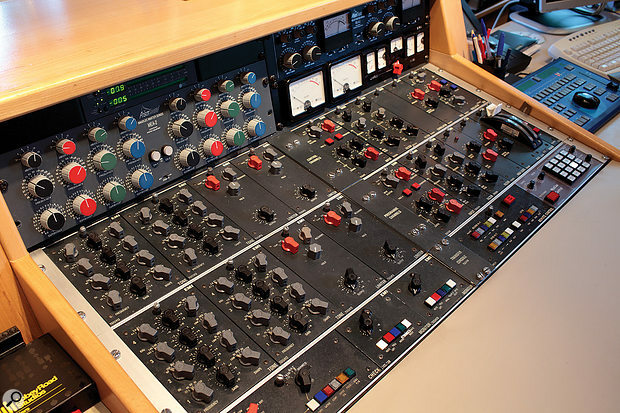 Both sites offer a deliberately limited palette of options for tailoring the mastering to your requirements. In the case of LANDR, all you get is a choice of three ‘intensity’ levels; more intensity seems to equate, roughly speaking, to louder and brighter. 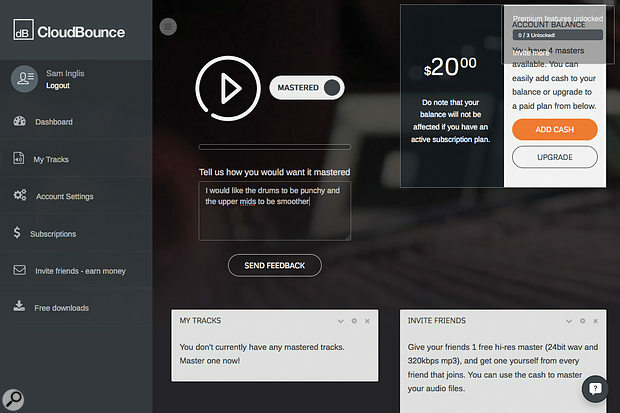 CloudBounce, meanwhile, lets you select Louder, Quieter, Warmer and More Bass as binary options; a fifth choice lets you send dedicated feedback on your master, but unfortunately this isn’t interpreted as instructions by the mastering engine — it just goes to the developers. One thing no human mastering engineer could possibly hope to match is the turnaround times offered by these sites, both of which operate signficantly faster than in real time. Slightly to my surprise, I found that both services defaulted to relatively subtle treatment on my first test track. At standard Intensity and loudness settings, both sites returned a master that was quieter than my fairly conservative home-brew effort; each, in its own way, was a shade brighter than the unmastered track, but neither changed the tonality a great deal. I’d have been perfectly happy to use either version, but in all honesty, I didn’t feel they represented a huge improvement over the results I’d got by putting IK’s Stealth Limiter over the mix bus. Pushing the Intensity or loudness in order to squeeze maximum loudness out of the track brought an uncomfortably gritty edge to things. By contrast, the version that Geoff Pesche of Abbey Road mastered was noticeably louder and much brighter than anything I could get out of LANDR or CloudBounce. In fact, Geoff commented that he thought the original mix was a bit lacking in top end. So are LANDR and CloudBounce not capable of identifying and compensating for mix problems of this sort, or was this just a question of personal preference? To find out, I tried loading up a much earlier rough mix of the same track, which definitely did have some issues of frequency balance, most obviously a hole in the mid-range. Both services altered the tonality a little more this time around, but if anything, they actually made the hole worse, adding brightness in the upper mid-range rather than filling out the 1kHz region. At present, then, it seems that the cloud services can’t offer the same ‘safety net’ as conventional mastering; nor can they give you the same sort of useful mix feedback that I got from Geoff. If you can bear to listen to multiple masters of a traditional ballad about the incident that ended Jesus’s football career, arranged in a disco style, head to this month’s media page at sosm.ag/sep16media to compare them. LANDR co-founder Justin Evans agrees that his service never “leaves well alone”, even when presented with a track that’s already been mastered. This, however, is not down to artificial intelligence or lack thereof, but because his clients expect LANDR to do something to whatever they upload. “Why we decided to always do at least something, instead of saying ‘Hey, great, your track is ready to go!’ is because of user feedback we got from our most engaged users. Some of our pro mixers are guys that mix very hot. They use LANDR, especially the low setting, for a transparent and light touch that smoothes some of the edges off their mix. We sent them out the version of the LANDR engine that wouldn’t make any changes to files it understood as ‘already mastered’, and we found that they kicked back pretty hard, since it took away the main use they had for LANDR. So our compromise has been to always do a little, no matter what. 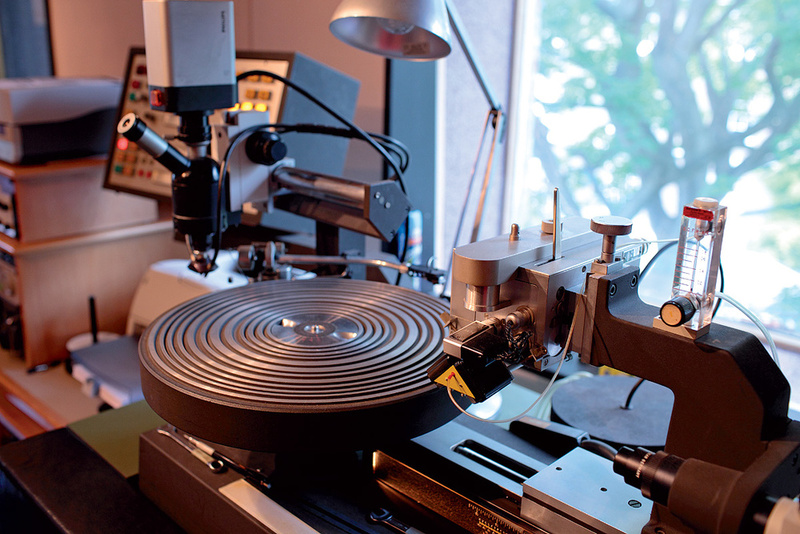 Cutting a vinyl master is a specialised skill which is currently off the table for automated services. Perhaps surprisingly, one key limitation of existing cloud-based mastering systems is their inability to carry out some of the more technical functions that are routine for their human counterparts. 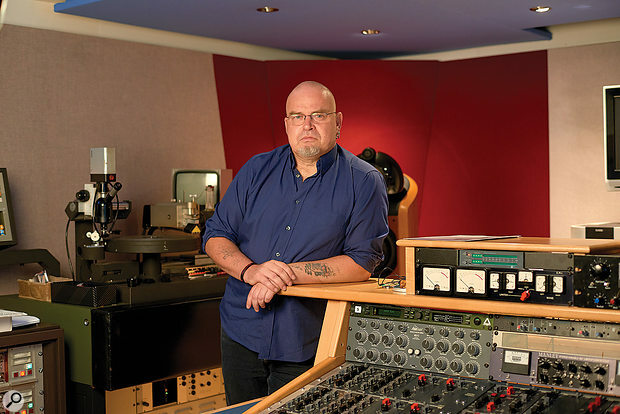 Abbey Road mastering engineer Sean Magee: “Important aspects of the mastering process, like adding PQ codes, gaps, fades, crossfades: they can’t be done automatically. Even taking out clicks, which we do all the time, is a hit-or-miss process. How does some software decide what is unwanted noise and what’s electronic percussion, or deliberately added vinyl crackle for ambience? When we listen, we know what’s music and what isn’t, what’s part of the intention and what’s a mistake, and we know what to remove or tone down.